Replacing your roof is a big decision. It goes without saying that you want the best roofing contractor for the job. But how do you know what to look for? Most people will only replace a roof once in a lifetime. It’s a big investment, and you want to make sure you choose the right company. You probably wouldn’t take your car to a mechanic who has been on the job for two weeks. And you probably wouldn’t sign up for heart surgery with a doctor fresh out of school. So why pick a roofing contractor that doesn’t have a long track record of doing high-quality work? In many cases, homeowners allow price to dictate the contractor they choose. As with most things in life, you get what you pay for. If you go with a roofing company that can give you a bargain price but can’t provide a list of happy customers, you’re probably going to end up with a substandard installation. Also keep in mind that it’s extremely difficult to collect a judgment against a contractor that simply closes its doors after a lawsuit. Unfortunately, fly-by-night contractors are notorious for disappearing to avoid paying damages, only to reopen months later under a new name. You can avoid falling victim to this type of unscrupulous contractor by working with a company that has decades in business and a solid reputation. 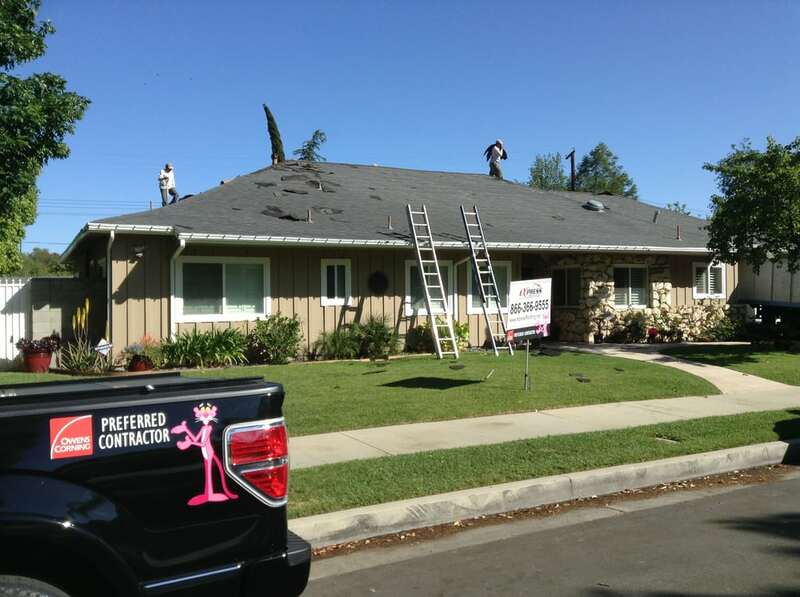 At Express Roofing, we’ve been installing roofs for homeowners in the San Fernando and Ventura County for over 30 years. For two decades, we’ve built a foundation of trust with homeowners. Chances are, we’ve installed a roof for someone in your neighborhood. Roofing is a dangerous job, which is why we never recommend homeowners take it on themselves. It’s important to have the right tools, materials and safety equipment. It’s also important to have experience. Reputable roofing contractors hold the requisite permits and licenses for every job they perform. A high-quality roofing installer will also carry all required roofing licensing (C-39) and insurance for its workers, which will cover them in the event someone is hurt during your roof’s installation. As a homeowner, you should never work with a contractor that can’t provide proof of proper insurance for its employees. For most businesses that provide a service, reputation is everything. Think about the last time you went to a new restaurant, or even visited a new hair salon or dentist’s office. In past years, you might have asked a friend or relative for the names of a good place to grab dinner or get your teeth cleaned. Today, however, the internet provides unbiased, third party reviews from people who have used a business’s services in the past. In fact, 81 percent of consumers say they research online before they make a purchase. Before you spend money, it pays to do your homework. What do other homeowners have to say about the roofing contractor? You can ask the company if it has a list of homeowners you can call, or you can check online for information about the company’s past jobs. Yelp, Angie’s List and Google are an excellent third-party review site that lets homeowners leave real feedback for contractors. At Express Roofing, we enjoy a 100 percent satisfaction rate among past customers, which is unmatched in the industry. If you’ve ever undertaken a home renovation project in the past, you may have been told to “get three estimates.” No one really knows where this so-called “three estimates” rule comes from, and no one seems to be able to say why three is the ideal number. In fact, there’s no reason why you should limit yourself to three estimates — or why you should go beyond one or two estimates when looking for a roofing contractor. Rather, you should spend time talking to potential roofing companies until you believe you’ve got all of the information you need to make an informed decision. Will the roofing company send its own workers to your home? The last thing you need to worry about is waking up on installation day and seeing an unfamiliar work crew on your property. The unfortunate reality is that some roofing contractors outsource their jobs to third party independent contractors. Furthermore, you have no way of knowing whether the independent contractor is qualified to install your new roof. Be wary of roofing companies that use these types of bait and switch tactics. No matter how carefully you plan a job, there is always a chance that something won’t go exactly as planned. If an error happens, how will the company handle it? This is something you need to know in advance. Will you spend hours on the phone, trying to reach a representative? Will the company take your money and run? At Express Roofing, we don’t accept a final payment until you are completely satisfied with your roof. And if you’re unsatisfied for any reason, we guarantee we will make it right. Watch any home improvement show on television, and you know that unplanned repairs and emergencies are more often the rule rather than the exception. As soon as you start knocking down walls or ripping out cabinets, you’re likely to find additional problems or the need for extra repairs or work. Roofs can work much the same way. In some cases, decking is rotten or damaged by moisture, or the crew discovers water damage that needs to be repaired before additional moisture makes its way inside a property. Ask your roofing contractor how it handles unexpected repairs. This way, even if you’re surprised, you know what to expect. 9. Will the Roofing Contractor Tear Off Your Old Roof? Some roofing companies will install new shingles over an old roof. However, this is almost always a bad idea. For one thing, it adds additional weight to a roof that is probably already aging and due for new decking. Two, it doesn’t address any underlying problems, such as damage concealed by old shingles. Just because you can’t see a problem doesn’t mean it’s not there. And when it comes to your roof, a concealed problem can mean major repairs in the future. In this way, slapping new shingles over an existing roof is a lot like putting a Band-Aid on an infected wound. You cover up the damage, but you do nothing to treat the real source of the injury. It can be an effective and cheap short-term solution, but it’s not a long-term fix. Worse, it usually ends up costing a homeowner a lot more down the road. Is the roofing contractor a preferred partner and authorized installer for the shingle manufacturer? This is an important consideration, as manufacturers won’t honor their warranties when a roof is installed by a non-authorized installer. Express Roofing is an Owens Corning™ Preferred Contractor, GAF Certified Weather stopper contractor and CertainTeed Certified Contractor. When you work with us, you know you are in good hands. Best of all, you have the peace of mind that comes with knowing your installation is backed by our warranty.